A new version of Let it Be, the stage show based on The Beatles, is coming to Dublin with a whole new second act that features an imagined reunion of the Fab Four. John Byrne reports from the Beatle capital, Liverpool. Originally a celebration of The Fab Four's incredible catalogue, this new version condenses The Beatles output into the first half of the performance, with the entire second act consisting of an imaginary get-together for John Lennon's 40th birthday, which would have occurred just weeks before Mark Chapman shot him dead outside his New York apartment. "I actually really love Act 2," says Gagliano. "I like doing the reunion because it feels like you can actually – in the first act you are going so quickly through all the amazing phases that they went through. In Act 2 it's much more relaxed. There are no costume changes or anything. There they are on stage, being those four guys, and it feels a lot more... it's a good feeling. And I've watched it work all over the world." For Irish Beatle fans – and we know you're out there in your droves – the good news is that the new-look Let it Be is coming to Dublin's Gaiety Theatre. It's running from Monday September 17 for six nights, with matinees on the Wednesday and Saturday. And for one of cast, the thought of visiting Ireland has a very personal side. John Brosnan may be based in London, but he has very strong Irish roots. It's quite ironic that he plays George Harrison, the Beatle with the greatest links of the Fab Four to Ireland, given that he had cousins in Dublin's Ballybough. "My dad's from the Dingle peninsula in county Kerry and my mum is from Clonmel," Brosnan explains, before adding: "And my daughter's going to Trinity College in Dublin. She's studying psychology. She said to me, after a year in Trinity, 'My priority is my social life and partying – because I'll never get these years back again'." Laughing, he shows off a little local Irish knowledge: "And the most exciting thing I've ever done in Let it Be was to play The Late Late Show. That was a highlight." 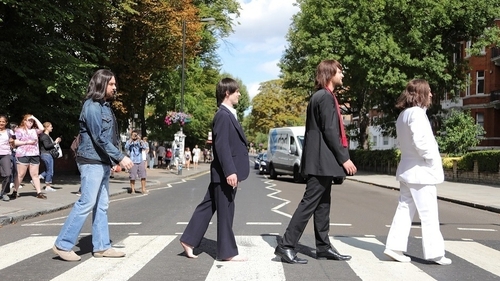 Both John Brosnan and Michael Gagliano - along with Emanuele Angeletti, who plays Paul McCartney - are old hands at this Beatle lark, being original members of the show when it first surfaced at the Prince of Wales Theatre on London's West End back in 2012. Michael notes that he's performed over 800 shows as John Lennon on the West End alone. Looking back to the beginning he recalls: "Six years ago we were head-hunted and auditioned for the West End show. For Let it Be. Me and John, who plays George, we worked together for years before that. They went around the world to get the cream of Beatle entertainment." Let it Be won't be everyone's cup of tea though. It's not really a theatrical presentation, and more of a concert. There's no story, or script, it's a series of situations where the band are playing live, ranging from their early days up the imagined reunion gig for John Lennon's 40th birthday. What it does have, though, is a hefty collection of some amazing songs, which is what The Beatles were all about. Nearly 40 in total, they range from early hits such as She Loves You and I Want to Hold Your Hand, to the more sophisticated Strawberry Fields Forever and A Day in the Life. The new Act 2 mainly focuses on The Beatles' solo work, including gems such as Imagine, Band on the Run and My Sweet Lord. It's fair to say that the four lads do an outrageously good impression of the Fabs on stage. The night I caught them was the opening one of their run at the Liverpool Empire. As audiences go, you'd imagine that the Beatle home town crowd would be the most demanding. After all, Liverpool is almost an open-air Beatle museum these days. "Everyone knows The Beatles, but there would be people here [in Liverpool] who actually worked with them," says Michael Gagliano. "So that is one of the most pressurised elements about coming to Liverpool. You feel under so much scrutiny." All four agree that the night went well – the crowd were on their feet early and often and demanded an encore, so there's no spoofing there – and they're all keen to emphasise how much they love The Beatles. Like about half the planet, they're big fans. When asked what they consider to be the best bit about being a Beatle, John Brosnan was first to reply. "For me, I think it's the audiences," he insists. "The music is so good, and to see people – particularly parents with their children, or older people getting emotional and crying – I think that's the best part of it. The music is so good, and people enjoy it so much, it's a pleasure to play it for them. It's very motivating." To wrap things up, the obvious question: what's your favourite Beatle song. Typically, chief spokesperson Michael Gaglioni is first off the blocks. "It changes every day, but it's always Strawberry Fields, because that's the most important pop record of all time," he says. "It's where The Beatles went from being just a pop band who wrote amazing songs, and a lot of them, to something from outer space. When you think about it, from Strawberry Fields onwards, they were from another planet. Nobody has ever managed to equal them." Emanuele Angeletti, the natural right-hander who was so dedicated to the Macca cause he taught himself how to play bass Southpaw, goes for a Paul song. "My favourite is The Long and Winding Road," he smiles. "I love piano, I love ballads." Ben Cullingworth, the baby of the group at 27 and an amazing mimic of Ringo Starr's unique drumming style – isn't tied to any one tune. "It changes all the time," he insists. "At the moment I really like in the show playing Come Together and Get Back." We'll leave the final choice to John Brosnan, who surprisingly doesn't go for one of George's classics. "It's either Across the Universe or Dear Prudence, I can't decide," he admits. "In this show, my favourite to play – this week – is Come Together. It grooves, and I'm really enjoying that song." Let it Be is at The Gaiety Theatre in Dublin from Sept 17-22.